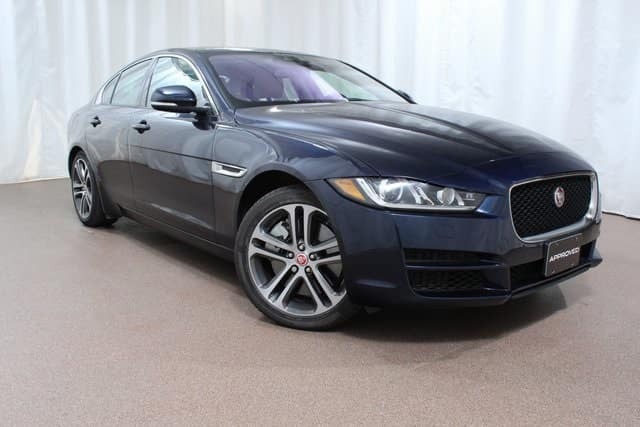 Luxury, advanced technological features, Approved Certified Preowned extras, and great fuel economy are all great benefits to this currently available 2017 Jaguar XE Premium! Equipped with a 3.0L V6 supercharged engine, you can expect an estimated 20 MPG city/29 MPG highway. That means you can enjoy this luxury sedan for a long time between fill-ups. This Jaguar XE Premium boasts intuitive and entertaining features including blind spot monitoring with close vehicle sensing, front and rear parking aids, and power moonroof. Also featured are heated washer jets, Meridian 380W Sound System w/11 Speakers, and Vision Package. This is just a small selection of what you will enjoy on this XE. Plus, as an Approved Certified Pre-Owned vehicle, you can look forward to benefits such as a 6-yr/100,000-mile limited warranty and 24/7 roadside assistance. It also comes with Land Rover Concierge and a vehicle history report. Stop into Jaguar Colorado Springs today to check out this luxury vehicle! You won’t be disappointed by its impressive features and powerful performance.